Visitors to the ELRIG Symposium will be able to see the Ultravap Mistral - a product designed to remove the traditional laboratory ‘bottleneck’ of solvent evaporation from microplates. 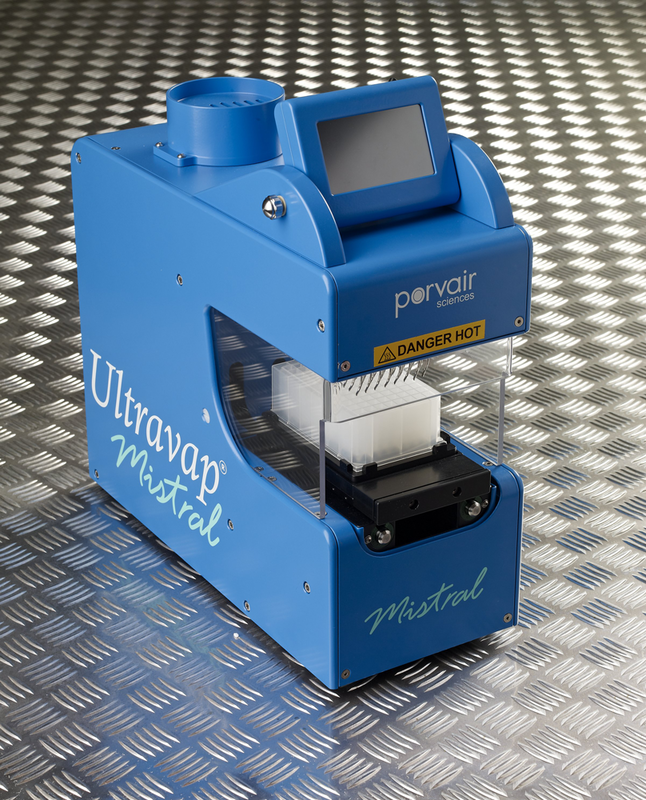 Designed to be automation-friendly, the Ultravap Mistral gives significant throughput advantages to laboratories looking to optimise microplate sample preparation. Faster than centrifugal evaporation for single plates, significant increases in sample throughput are achieved through advanced evaporator head technology and an innovative manifold design, which directly injects heated nitrogen into each individual well of the microplate simultaneously. Installation requires only connection to a gas supply and mains electricity. Safety of operation is ensured as this CE-marked compact unit fits into all fume cupboards and boasts full integral fume management within the unit. Designed to be easily assembled and disassembled by robotic manipulators the Porvair Sciences Universal Robotic Manifold enables productive automation of SPE or DNA clean-up procedures. Able to accommodate collection plates from 14mm - 44mm in height and adaptable to work with three different lengths of drip director the Universal Robotic Manifold offers the unique capability of being able to operate with all brands of filter plate and waste collection reservoir tray. The MiniSeal Plus is a budget priced electronically controlled thermal sealer developed for laboratories sealing small to medium batches of microplates. The versatile device is capable of producing an accurate and tight seal on any ANSI / SLAS standard, deep well or PCR microplate from 3 to 62mm in height. At this important meeting - Porvair Sciences will also be showing a selection of its comprehensive range of applications optimised microplates.